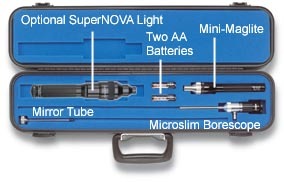 The Hawkeye MicroSlim Kit contains a 0° direction-of-view MicroSlim borescope with a protective sleeve, a 90° Mirror Tube and a Mini-Maglite source all in a lockable aluminum carrying case. The SuperNOVA Kit shown above adds the 10X brighter SuperNOVA Light. Fits Where Others Can't At less than 73 thousandths of an inch in diameter, the MicroSlim is now the "slimmest" borescope in the Hawkeye line. This is a completely new Hawkeye utilizing our next-generation endoGRINS® lens relays. Due to the very low dispersion of these new lenses, even a scope in this micro diameter range delivers larger, brighter images, at a lower cost , than equal diameter competitive products. The MicroSlim is invaluable to manufacturers of fuel injectors, hydraulics & pneumatics and miniature valve manifolds. 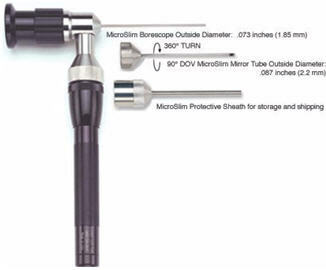 All micro-borescopes are very delicate and must be treated more carefully than larger diameter scopes. Kits include a shipping sheath for use when transporting or storing. All Hawkeye MicroSlim borescopes have a 0° direction-of-view and 40° field-of-view. A rotating 90° direction-of-view is achieved by sliding a MicroSlim Mirror Tube onto the scope. The standard kit includes a 3" Hawkeye MicroSlim Precision Borescope w/ 0° direction-of-view, a 90° direction-of-view Mirror Tube, a Mini-Maglite® lightsource, a rugged, lockable, aluminum case, a shipping sheath, a Hawkeye cleaning kit, and two AA batteries.